The Times and Sunday Times have now disappeared behind a pay-wall, with the UK's media watching with interest to see what kind of impact it has on one of the world's most famous papers. 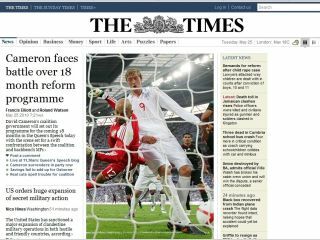 Although the new Times sites launched with a trial for registered users, people will now be required to pay fees of £1 a day or £3 a week – with a 30-day £1 trial. Publishers News International have little illusion that the decision will decimate the number of people visiting the papers' online versions, but believe that content must be paid for going forward. The longer term subscription includes 'Times+' benefits and offers from the paper, plus mobile access, and daily games and puzzles. "We have been very pleased with the response from readers since the launch of the new websites in May," Rebekah Brooks, chief executive of News International, told the Guardian. "The new sites showcase our award-winning journalism in a very visual way, giving readers exclusive content and interactivity so that they can get even more from the news. But will the public agree? The media world will look on with great interest.